Sixteen players participated in this Sunday's tournament. CCFC regular Eugene Ulyanov crushed the competition by winning the top quad with a perfect score. The second quad was much closer with James Weisz edging out the competition by just half a point with 2/3. 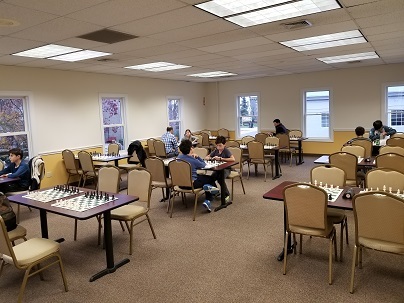 The third section was a six player swiss with Adan Wang and Ana Gazoni drawing in the final round to share first place honors with 2.5/3 each. 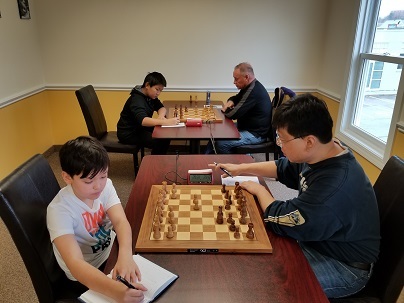 The final section of the day was a single game match between NM Maximillian Lu and expert Bryan Weisz. As part of their preparation for next weekend's national championships in Orlando they played a practice 90 minute game. Ultimately the game ended in a hard fought draw.